When Plantar Fasciitis keeps you from running or doing the things you love, recovery cannot come fast enough. The AEXCare Night Plantar Fasciitis Sleep Support cradles your foot in the recommended position to help you feel better in the morning. The low-profile design doesn't distract as you're nodding off to sleep, and the breathable, lightweight materials help keep you cool throughout the night. Help your foot rest while you sleep with the comforting support of the AEXCare Night Plantar Fasciitis Sleep Support. 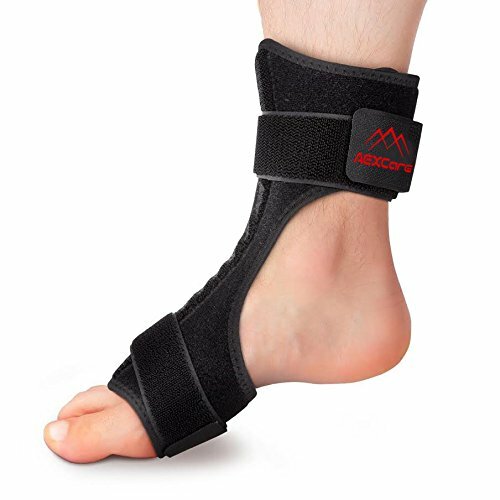 Convenient and practicle foot support that works by a bendable aluminum strip at the instep position, the foot splint is designed to hold your foot in a flexed position. Splint is medically proven more effective than any other overnight treatment. The gentle stretch will relieve pain, prevent further damage. AEXCare dorsal foot night splint is more comfortable and less bulky than boot style braces. The foot and ankle straps are completely adjustable, long enough to wrap around most feet and ankles. The plantar fasciitis night splint can be used on right and left foot. Our Plantar Fasciitis Splint is backed by Amazon's Return Policy. If you have any questions about this product by AEXCare, contact us by completing and submitting the form below. If you are looking for a specif part number, please include it with your message.